Hugh Jackman, Christian Bale, Michael Caine and Scarlett Johansson are pure magic in The Prestige on Blu-ray Disc®. Dubbed "wildly entertaining" by Rolling Stone, this riveting tale is more astounding than ever in this dazzling new format. Two young, passionate magicians are friends and partners until one fateful night when their biggest trick goes terribly wrong. Now the bitterest of enemies, they will stop at nothing – including deceit and sabotage – to learn each other's secrets. Experience their obsessive rivalry in eye-popping 1080p and resounding 5.1 48kHz, 24-bit uncompressed audio. But remember, nothing is what it seems, so be prepared to watch over and over again as Blu-ray™ High Definition teases and tantalizes your senses! I thought this was a really stellar film. It's a wonderful character study of two obsessed men, and how that obsession drives them to destruction. The plot - without saying too much, about two rival stage magicians seeking to both one-up and destroy the other - moves from one twist to the next, opening up one layer only after you have become comfortable with the previous. All of the cast do a great job, though Jackman and Bale have the most on their shoulders as the leads, and they carry it off spectacularly. Michael Caine is also great, as is David Bowie, in their respective supporting roles. It's quite stylish and sophisticated, as well as very, very good. Highly recommended. We decided to watch this one today since it's David Bowie's birthday. Also, watching an actually good movie is a welcome treat after the last two films we've watched. I agree on both counts... Good movie, enjoyed every minute of it... and much better then the last couple we attempted to watch. I had to watch the Prestige two times before actually understanding it. Great performances all around and the petty competition between the two magician, or illusionists, is great to watch. What I really enjoy is that mind bending twist. Jackman thinks Bale is using actual magic. Being jealous and wanting to better him, he invents actual "magic" (well, Tesla does, but that's details). Then it turns out, that Bale never actually used real magic... Awesome twist. I need to watch this one again. I agree...very well done movie. Awesome. And I had no clue how stuff would work out when I first saw it. I saw it in the theater..I was so glad it came here..that was right after the new, slightly larger theater opened, and they started getting more movies that they hadn't before. The Illusionist is also very good. It came out around the same time and also deals with a magician. Okay .. okay .. I surrender. I have pulled out my copy of Prestige and watching again. It is, along with The Illusionist, one of my favorite "magic" films. And even as I type "magic" i know that that is not what it is about. Let's face it there have only been a handful of real magicians in the world .. including the great Nicola Tesla Don't forget the 3rd of Clarke's Laws ... "Any sufficiently advanced technology is indistinguishable from magic." I very much preferred The Illusionist. The Prestige was a great movie. But it wasn't a "magic" movie in my eyes. So I felt a bit cheated by that. Kinda turned me off a little. I need to watch both of them again - Prestige and Illusionist. I just need like 20 more hours in a day to keep up with everything I want to watch..especially since back to work more. Both movies were presented as "Magic" movies. What I liked about The Illusionist is that at the end, they walk you through the "trick". You see how everyone was fooled. The Prestige does the same thing. But in my opinion, there was no "trick". Without giving too much away (you'll know if you've seen it), the ending changed it from a "Magic" movie to something altogether different. Not that it was a bad movie. It just felt like false advertising to me. I'm a big nut for puzzles (of the Rubik's variety, not jigsaw). Have a bunch here on my desk. And a lot more at home. The Prestige reminds me of my least favorite type of puzzle. You don't need a brain or logic or steady fingers to solve these puzzles. They're nothing more than tricks. One is a washer on a bold with the nut welded to the bolt and you're supposed to remove the washer. There is no clever solution to the "puzzle". It's threaded backwards and the bolt is actually cut in two. It's not something that the observant person would "solve". It's nothing more than a cheap trick. A gimmick. That's how The Prestige made me feel. I followed it very closely and was quite into it. Then at the end they threw it all out the window and you find out the movie is something other than what was advertised. It wasn't a shocking twist. It just felt like a cheat. But that's exactly what all real-life "magic" is about. If you know how it is done it boils down to a (more or less) simple trick. Or in other words: If you know how the illusion is achieved the magic is gone. 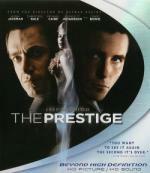 And in this regard "The Prestige" is one of the best movies about magicians and illusionists. I don't know .. I got to see Penn and Teller in Vegas a couple of years ago (if you get the chance do it) and even when they show you the 'trick' the magic isn't gone because they can still fool you. Of course this isn't magic but illusion. Had it been about real-life "magic", that would be a different movie. I felt it was presented as a movie about illusions, as The Illusionist was. The "how it's done" at the end was unsatisfying for me because unlike the rest of the movie, it wasn't an illusion. Right in the final minutes, they changed the rules of the game. You don't find out how the trick was done because it wasn't a trick. As I said, I still enjoy the movie. And now that I know what's coming, it doesn't annoy me. But that first viewing wasn't not enjoyable.